The site of one of the city's medieval gates, St. Michael's Tower & Street also serves as the historical route the kings of Hungary once walked to the main square. Pass through the gate under the Baroque clock tower--the last remaining example of the wall originally constructed around the turn of the 14th century. Keep an eye out for the marker under the tower that shows the distances from Bratislava to other capital cities. Carry on down the narrow street, following the crown symbols as you imagine the royal processions that once followed this path. Alternatively, make your way up to the tower to view its small medieval weapons museum and take in a view over the streets and rooftops of the old town. 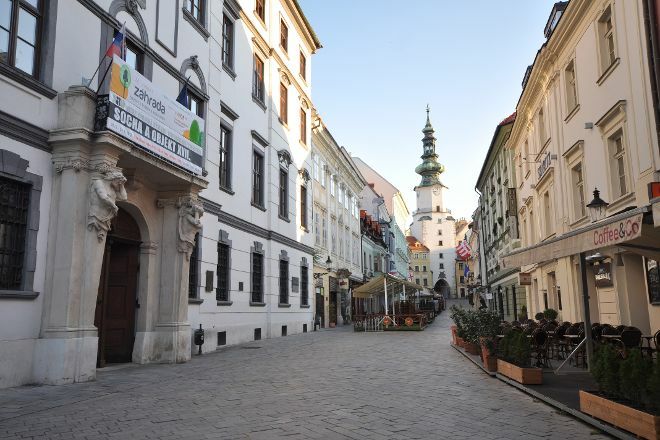 For travelers who use our online itinerary creator, Bratislava holidays become easier to arrange, with trips to the St. Michael's Tower & Street and other attractions mapped out and timetabled. Corner with much charm, the tower is very beautiful and the atmosphere in the area is very good. Visit obliged. Here it is certainly nice to stay. Beautiful Street to walk through. Many cafés, restaurants, souvenir shops and as icing on the cake St. Michael's Tower. one of the best places in Bratislava. Every day, we help thousands of travelers plan great vacations. Here are some tips on how to use your Listing Page to attract more travelers to your business - St. Michael's Tower & Street. Promote your permanent link - https://www.inspirock.com/slovakia/bratislava/st-michaels-tower-and-street-a220765975 - on your website, your blog, and social media. When a traveler builds a plan from this page, the itinerary automatically includes St. Michael's Tower & Street. This is a great way for travelers looking for a great vacation in your city or country to also experience St. Michael's Tower & Street. Promoting your link also lets your audience know that you are featured on a rapidly growing travel site. In addition, the more this page is used, the more we will promote St. Michael's Tower & Street to other Inspirock users. For best results, use the customized Trip Planning Widget for St. Michael's Tower & Street on your website. It has all the advantages mentioned above, plus users to your site can conveniently access it directly on your site. Visitors to your site will appreciate you offering them help with planning their vacation. Setting this up takes just a few minutes - Click here for instructions.